Revolution Chiropractic - What is Webster's Technique? Webster’s Technique is a chiropractic analysis and adjusting technique that was first developed by the late Larry Webster – a renowned pediatric and perinatal chiropractor, and founder of the ICPA. The purpose of the Webster’s Technique is to optimize the structure, biomechanics, and neurology of the pelvis in pregnant women. The specific analysis determines if and what the subluxation malposition/fixation of the sacrum is and based on the direction of the malposition/fixation (what chiropractors often refer to as a “listing”) certain predictable soft tissue structures will also become taught and/or hypertonic – specifically, and most frequently the round ligament of the uterus, as well as a few other structures in the low-back and pelvis area. If through the analysis, it is determined that there is a subluxation of the sacrum, gentle and specific chiropractic adjustments are used to correct the malposition/fixation of the sacrum, thereby reducing the subluxation. Following the adjustment, specific soft-tissue myofascial releases are performed on any taught/hypertonic fibers and trigger points palpated in the round ligament and other ligaments/muscles in the region. Once the structure, biomechanics, and neurology of the pelvis have been optimized, the baby will have the ideal conditions to move and grow. The bonus for the mother is that she will be more comfortable and she will be able to enjoy her pregnancy more! 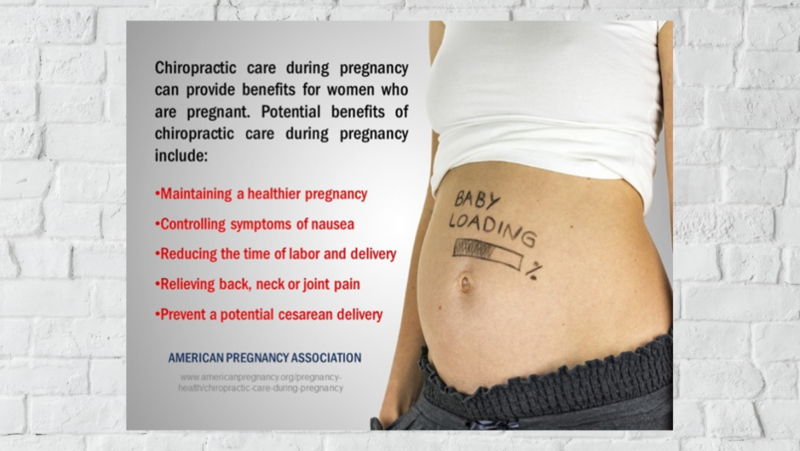 Then, when it comes time for the baby to leave the womb and enter this world, having the structure, biomechanics, and neurology of the pelvis functioning at their optimum levels will help the birthing process proceed as smoothly as possible for both the mother and the baby.